Offering you a complete choice of products which include cotton seed cleaner (drum type). 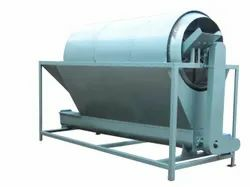 Cotton Seed Cleaner offered are made available in precision construction designs as well as backed with advanced technical support that allows these machines to deliver optimum performance in defined working processes. Delivering effective seed cleaning operations, its usage also helps in improving the quality of lint. Further, the machine also features the option of regulation of volume that is achieved through vane type feeder. The volume can also be varied through setting hinged fed gate in multiple installation options.